Bracelets made from 18 gauge stainless steel piano wire. Even if you can't tickle the ivories like the Piano Man, you can still don these unique bracelets. Each set of bracelets is made from 18 gauge stainless steel piano wire. The wire is plated for protection and soldered into 2.25" diameter loops. They are currently available in four styles: Black, Hematite, Gold with Turquoise, and Silver with Turquoise. Sets of Black, Silver, and Gold include twelve (12) individual strands that also feature four beads (silver or turquoise) for a touch of flair. The Hematite sets include eighteen (18) strands with no beads. 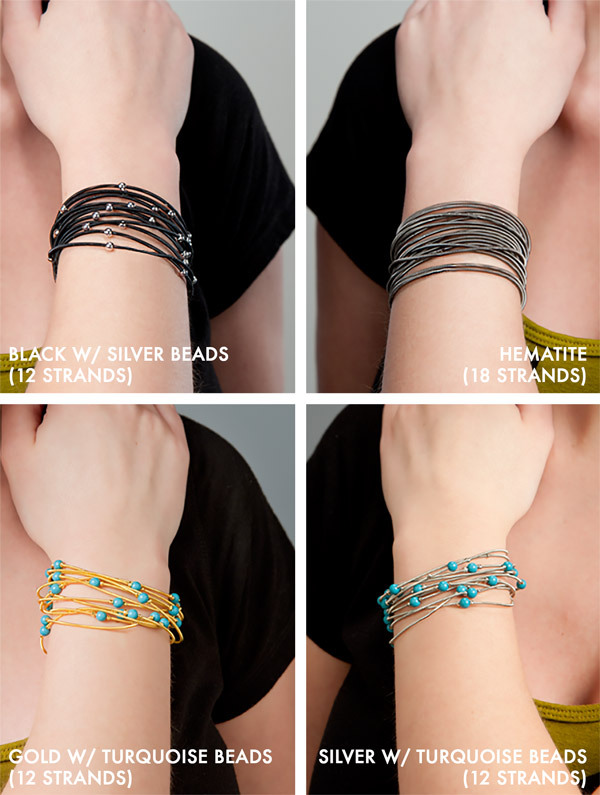 Each set (depending on the style) includes either twelve or eighteen strands of 18 gauge stainless steel piano wire that have been transformed into bracelets. On the black version, four silver beads (fixed in placed) adorn each hand-made bracelet. On the gold and silver editions, there are four turquoise beads per strand. You'll love this set of bracelets made from stainless steel piano wire. 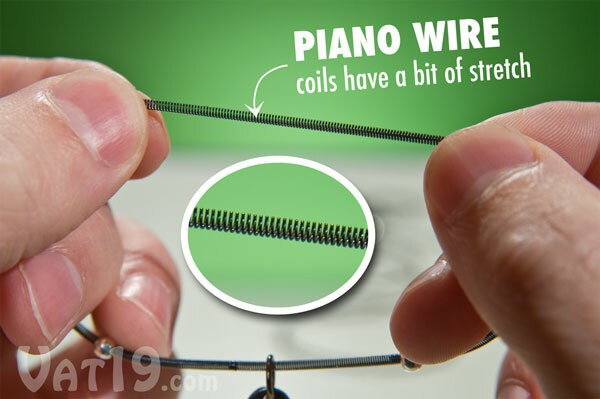 A piano wire is actually a tightly coiled spring (which you can see when it is stretched). 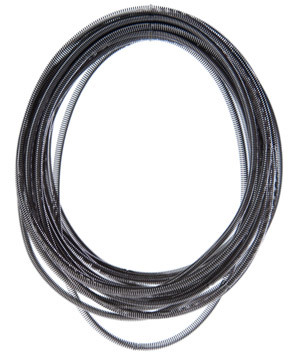 This elasticity makes it a bit easier to get the Piano Wire Bracelets on and off your wrist. The coils of the piano wire provide a bit of stretch in the bracelets, making it easier to put them on. The Piano Wire Bracelets are available in four styles: Black, Hematite, Gold with Turquoise Beads, and Silver with Turquoise Beads. The Black Piano Wire Bracelets come in a set of twelve (12) strands with silver beads on each strand. 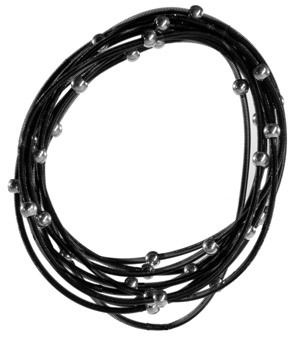 The Hematite Piano Wire Bracelets come in a set of eighteen (18) strands. They do not feature beads. 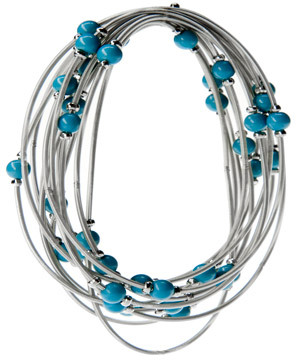 The Gold and Silver Piano Wire Bracelets come in a set of twelve (12) strands with turquoise beads on each strand. The Piano Wire Bracelet is currently available in four styles. except Hematite which includes 18 strands and no beads. 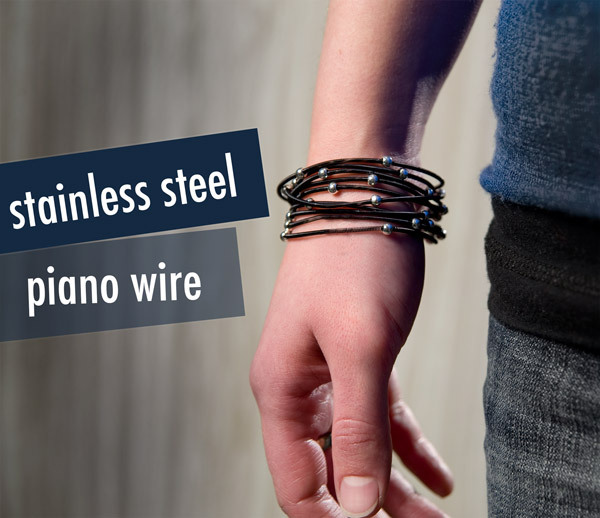 Piano Wire Bracelets should not get soaked in water, so don't wear them in the shower. We suggest that you put them on one at a time to avoid overstretching the bracelets. Do not polish your Piano Wire Bracelets. To complete your collection of musical-instrument-inspired jewelry, please check out the Guitar String Bracelet. Over-the-door basketball hoop laundry hamper.